Explorer Darrell Miklos has been investigating more than 100 magnetic ‘anomalies’ using maps created in the 1960s by his friend and famed NASA astronaut Cooper to locate shipwrecks in the Caribbean. However, the latest installment of the show includes an unexpected discovery at an undisclosed location near the Bahamas. Miklos had expected to find an ancient shipwreck but instead, the explorer said he found an astonishing structure unlike anything he had seen before. The ‘unidentified submerged object’ (USO) is huge, and has 15 long 15,300ft obtrusions extending from its side. 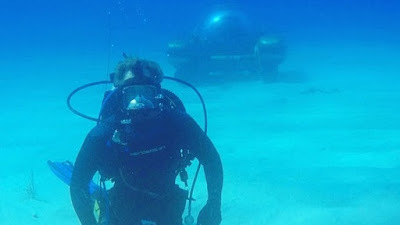 Footage of Miklos discovering the bizarre object shows the explorer in a two-man state of the art submarine venturing 300ft below the surface before stumbling upon the ‘alien spaceship’. “It was a formation unlike anything I've ever seen related to shipwreck material, it was too big for that,” said Miklos to The Daily Mail. “It was also something that was completely different from anything that I've seen that was made by nature,” he added. After making the shocking discovery, Miklos retreated to the surface to consult Gordon’s secret maps and found the area had actually been marked with “unidentified object” and not the usual “shipwreck”. “He had to mean it might be something from another world. Gordon believed in aliens. He believed that we had visitors from other planets and he also believed that a lot of these things landed in this particular part of the world,” explained Miklos. Cooper made the discoveries using long range detection equipment to spot nuclear threats on Earth, a secret second part to his space mission. So far Cooper’s maps have led Miklos to dozens of shipwreck discoveries worth millions of dollars, but this latest discovery could be the most exciting yet. “I want to investigate it. I want to see what it is, because it may be nature made, just a freak of nature, but given its placement in this particular part of the Caribbean and given what Gordon has told me about visitors from another planet and the things that I've seen, I think it's definitely worthwhile investigating,” said Miklos.